OSP Holiday is one of the beautiful templates, taking into account our high use. It can be used in the Real estate websites, along with OS Property - Joomla Real Estate extension - to provide a perfect combination. More particularly, this template is designed to integrate with OS Calendar - an Availability Calendar add on for OS Property; it can help you build a power rental estate website. 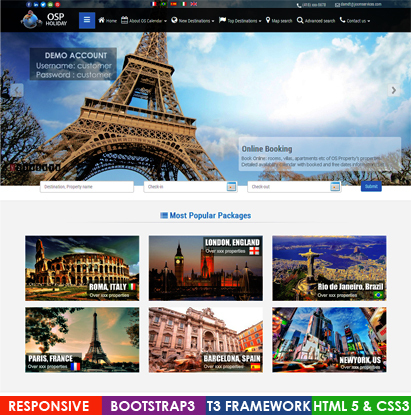 Combined with T3 framework, Bootstrap 3, Html5 and Css3, you have the opportunity to own a new generation website with the most modern web technologies.